Angela Strassheim, Evidence No. 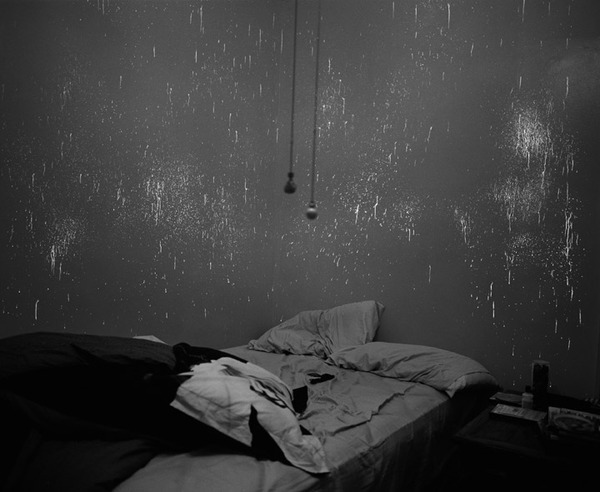 2, 2009, 46×58 inches, Edition of 8. Courtesy of Marvelli Gallery. On November 13, I attended a symposium at Rutgers University entitled Photography and Evidence. It was put together by The Developing Room (http://developingroom.com/event/photography-and-evidence) and was sponsored by the Center for Cultural Analysis, the Dean of the Humanities (Rutgers School of Arts and Sciences), and the Art History Department. discussion of the relationship between photography and evidence. What does the notion of evidence do to the practice, use and form of photography, particularly at moments when the medium’s veracity is called into question? How was the testimonial function of photography established in law and the popular imagination, and what sort of systems sustained or impugned it? What is the appropriate look of an evidentiary photograph both in the past and today? The symposium was very interesting. Two speakers were academics: Jordan Bear (U. of Toronto) presented “Reasonable Doubt? On the ‘Resolution’ of Contradictory Photographs” and looked at the historical construction of photographic vision as legal evidence within a series of court cases and cultural practices from the early 20th century; and Catherine Zuromskis (U. of New Mexico), “Feeling History: Evidence, Vernacular Documentation, and the Kennedy Assassination,” focused on the changing role of visual evidence in the construction of late-modern subjectivities, analyzing the JFK assassination’s reconfiguration as an historical event built around affect in the form of a walk through of the 6th Floor Museum (http://www.jfk.org/), and using some of Jonathan Crary’s arguments from his book 24/7; and two of the speakers were photographers themselves: Angela Strassheim presented photographs from her exhibition Evidemce and photographer, Gary Schneider (Mason Gross School, Rutgers University) closed the panel with a response to the previous panels and a question and answer session. For me the most interesting part of the symposium was experiencing Angela Strassheim’s photographs. Additionally, her art confounds conceptions of photography as a form of writing, or at least an impression, on the film’s emulsion made with reflected light. Instead, the captured image is produced by a luminous chemical reaction between the luminol and the traces of the human body. The traces of organic material on the physical surface of the profilmic space is the primary latent image that is developed by the photographer through the application of the chemical spray, while the image captured by the camera works to fix the image (the chemical and the latent image fade very quickly). As much as the photographer emphasized the emotional content of the pictures in her presentation (they are indeed haunting), I found myself focusing mainly on her visual play on the historical art of photography itself, seeing the development of the luminous images as an externalization of the photographic process itself and its breaking down into constitutive elements, inserting the world into the camera’s interior. The fact that the artist chooses photochemical photography to capture her photochemically-mediated scenes is fitting. I’m still grappling with the ethical concerns these images invoke, or at least determining what exactly these photos might tell us about the relationship between evidence and affect. The resulting images are certainly evidence of something, but the effect is not informational, but instead provokes an emotional, or even visceral response. And as much as some of the photos (and stories that go with the photos) are a bit macabre at times (for me, at least), there is something interesting happening in the idea that the images are produced by a glowing chemical rather than reflected light… There was a serendipitous moment during one of her photo shoots in which a peephole in the door produced a long beam of light that cut across the darkened room, reminding me of the construction of the camera obscura and the earliest mechanism for forming ‘veridical’ images of the world. This connects well with my conceptualization of her practice as based around the externalization of the photographic apparatus, giving spaces an active role in the production of visual evidence. I’m still pondering… What type of perceiving subject and scopic regime does this type of “lightless” chemical photography imply?